Loewe Reference ID is new high-end TV range | What Hi-Fi? Loewe Reference ID range comes in three screen sizes, 40in, 46in and 55in, and claimes to be "the Mercedes SLS AMG of TVs"
Continuing its trend of producing high-end TVs, Loewe has announced that the Reference ID TV range will go on sale in the UK in July. On show at last years IFA, Loewe claims the Reference ID will offer "greater potential for completely bespoke personalisation". The Reference ID range will be available in three sizes (40in, 46in and 55in), with an initial choice of four colours. This choice will expand throughout the year as Loewe hopes to launch a 'bespoke tailoring' option before the year's end. Owners will be able to choose their colours, materials and motifs to create a highly personalised TV. The Reference ID will ship with Dolby Digital and be equipped with an integrated multichannel decoder. It will also feature "160 watts of integrated audio muscle" for "an exceptional sonic performance". For those looking for an all-together more powerful sound system, there's the option of complimentary floorstanding speakers. The Loewe TV has a Full HD, "400Hz" panel, a built-in DR+ PVR – equipped with 1TB of storage space – that can record both 2D and 3D content. Smart TV is covered by various video and audio on demand services, as well as apps for Facebook and Twitter, accessible through Loewe's MediaNet portal. 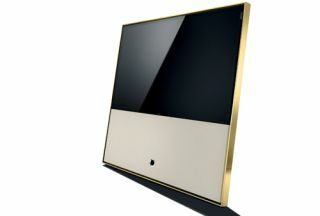 A 40in Loewe Reference ID TV will be available for £4,500, a 46in TV at £5,500 and the 55in at £6,500.